Yesterday I was building a list with my intern Lindsay of the most important foods for a college athlete to buy at the grocery store, and I got to thinking this might be fun to do on the blog. A list of the top 10 foods that always land in my grocery cart each week, and show you how I use them. Eggs. I’m obsessed. Eggs in the morning, for sure almost. every. day. You can count on that. I like the way that scrambled eggs make me feel first thing in the morning. My favorite way to eat eggs is with a big bowl of roasted veggies on top of either roasted potatoes or grits. 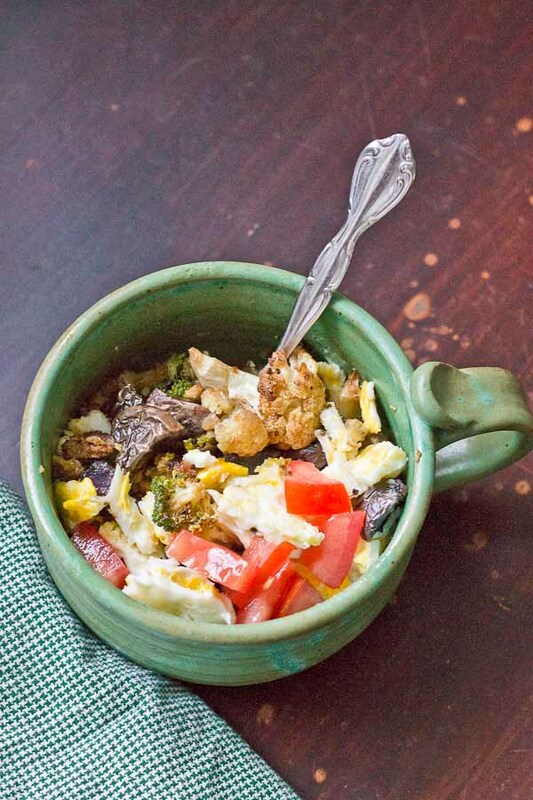 Get one of my Veggie Breakfast Bowl recipes here. Greens. I like having a big salad for lunch so I always stock up on greens that are in the containers not bags. I usually go for the “organic girl” greens because I think they keep fresh longer and I like the varieties. 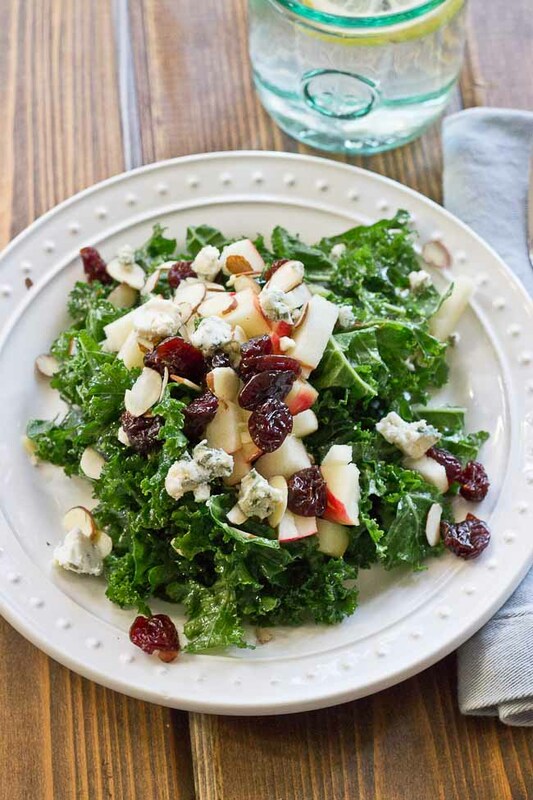 Try this Apple & Kale Power Salad. Coffee. First thing in the morning, coffee time is happening. I’m a fan of light roast coffee and so is Eric. Good thing! Maybe I should add half and half to this list cause I can’t enjoy coffee without a little drop of half and half. No sugar please, but I like it creamy. 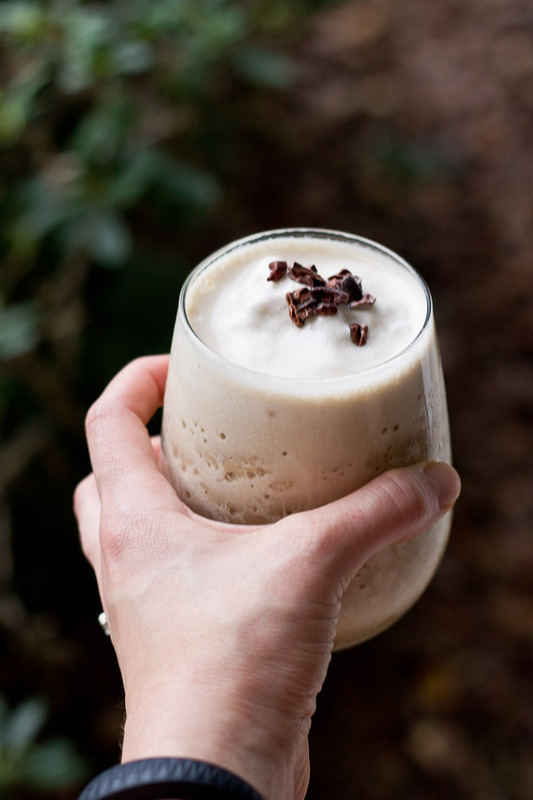 For an afternoon pick me up, I’ll sometimes add a little coffee to a smoothie, like in this Coffee Lover’s Protein Shake. Dried Fruit. Dates or Dried Tart Cherries. These are my jam. Every day I eat them up. Often when I first wake up I’ll grab a date to get me going in the morning, or I’ll snack on them through out the day for energy. 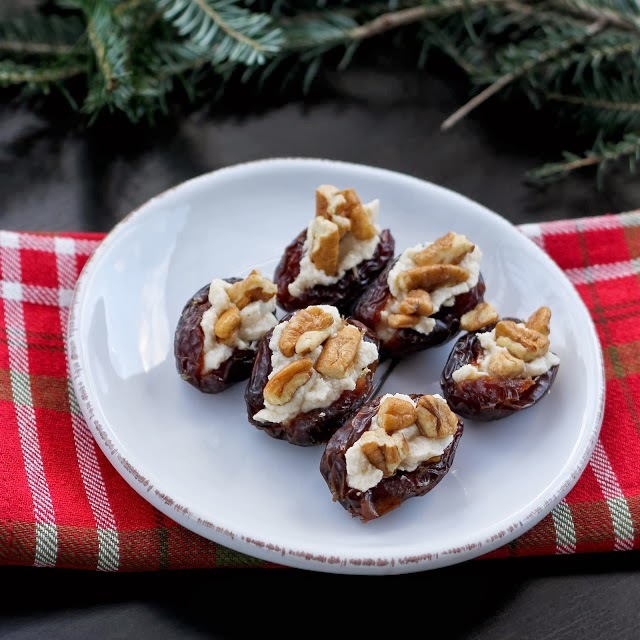 I love eating the Medjool dates with the pit, they are fresher and more moist, and I add a pecan to the middle of them… kinda like these Stuffed Medjool Dates but without the marscarpone, that’s only for special occasions. :o) And I’ve recently been into using dates in place of sugar in recipes like in these Flour-less Fudge Brownie Bites with Greek Yogurt Frosting. As you know dried tart cherries make it into a lot of my recipes, but I’m literally obsessed. I always add them to a salad or tuna for lunch. Gluten Free Bread. We have really tapered our bread intake since I got the ALCAT results back, but I like to have a slice of bread for breakfast with eggs, or occasionally we will make grilled cheese for a quick dinner on a weeknight. Nuts/Seeds/Nut Butter. These are one of my go to snacks. Apples with PB or Trail Mix. 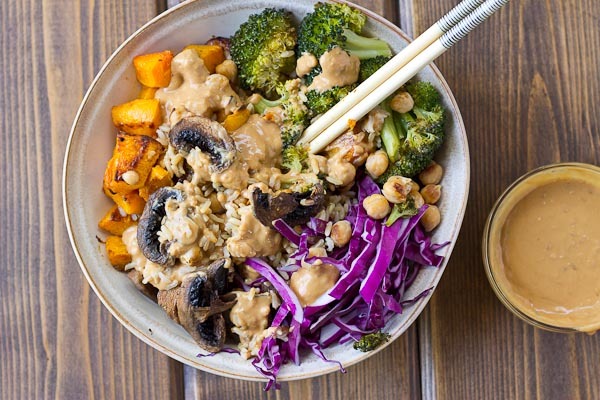 I always add nuts and seeds to my salad, and lately I’ve been a fan of mixing in nut butters into dressings. Like in this favorite Abundance Bowl. YUMMMMM. Almond Milk. Unsweetened of course. It’s my go to because of the yummy taste. I add it to smoothies, and I like to have a glass of almond milk in the evening with a dark chocolate square for a little night cap. 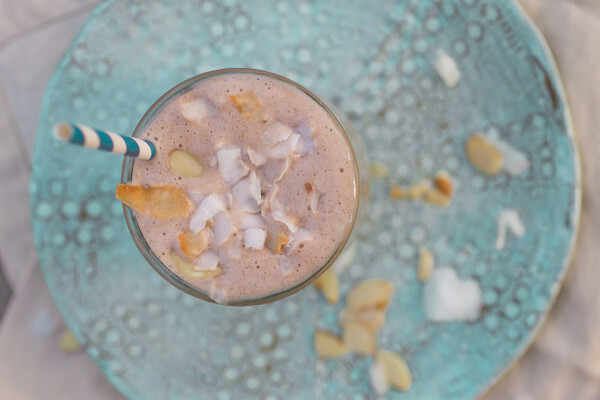 This Almond Joy Protein Shake has all the almondy goodness. Tuna. Tuna is divine. I’m kinda obsessed with albacore tuna canned in olive oil. I add a little mayo, tart cherries, and sunflower seeds. That’s my go to combo for lunches. Tuna makes me feel good because I know I’m getting lots of omega 3s. Yeah, I kinda worry about the mercury content so I only eat it like 1-2 times per week and I usually try to buy Wild Planet Tuna because they have lower mercury. But I read an interesting article this week on how the benefits of omegas outweighs mercury exposure. Honestly that has always been my thought process too… Moderation peeps. Seasonal Produce. Most of my grocery cart is usually filled with produce that I can roast. 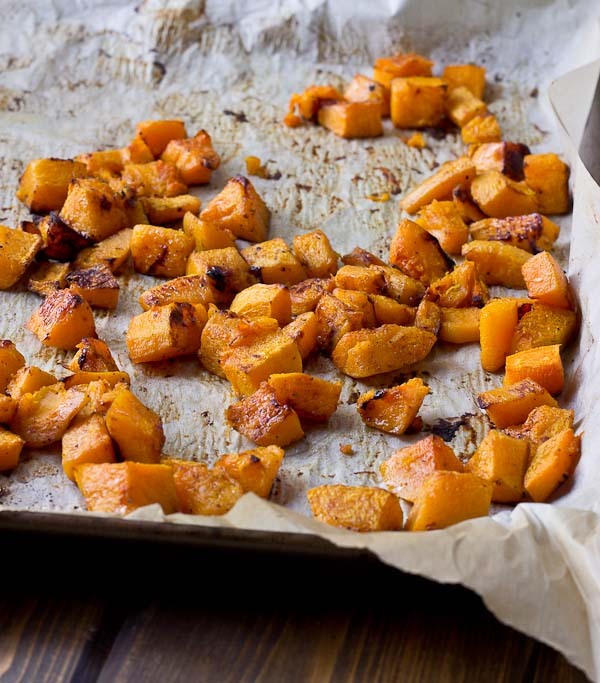 Ranking high on the list are onions, peppers, mushrooms, butternut squash, and broccoli. You know I’ve loved all the butternut squash and pumpkin in the fall, and as we are nearing spring my cart is filled with more berries and bok choy. Beans. I really try to work more beans into my diet because of the fiber punch. My go to beans are chickpeas. They are yum topped on top of a salad or blended into a hummus. I also like pinto beans a lot and we use black beans quite a bit too. I usually buy the low sodium variety and just give them a good rinse because that decreases the sodium content by about 40%! 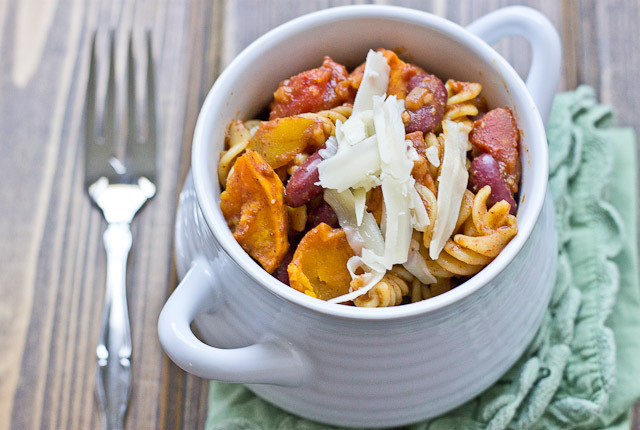 If you’re trying to up your fiber intake try this Butternut Squash Chili Mac. So I want to hear from you, what are your top foods that ALWAYS make it in your grocery cart? Leave a comment below and/or share a top 10 list on your blog. I have to get kid foods for the hubs too 🙂 he really likes rice pudding…it’s like every other week for him. My list is very similar as well: eggs, cottage cheese, salmon, greens, season produce, almond/coconut milk, almonds, goat cheese, Greek yogurt. love me some goat cheese. Hmmm love this and made me think. I guess bananas, leafy greens (spinach, collards, or kale), 2% plain yogurt, chicken or tofu, canned beans, canned tomatoes, carrots, onion, peanut butter and cow or almond milk. Thanks Marisa! I need to add tofu to my list again. It’s been too long. My cart looks just about the same, except some Greek yogurt instead of dried fruits. I’m curious, why do you buy your greens in packages instead of bags? Just to stay fresher? To me it stays fresher… and I like to buy organic greens, and those are usually in the plastic box-things. I love my go-to items for a quick trip in and out of the store, but find if I make a list I get less distracted by sales and excess produce, hah. We get eggs, breakfast sausage, fresh sliced deli meat/raw chicken breasts, canned coconut milk (we dilute it with water to drink/cook with-instead of carton stuff – makes GREAT ice cream), beans (black and garbanzo mostly), almonds (to make almond butter of course), raw cashew pieces (to make ‘cheese’ and sauces with), seasonal fresh produce, corn tortillas/GF tortillas/butter lettuce/GF bread (all for sandwiches and wraps and such), and dark chocolate of course. Coconut milk sounds good!!! I need to learn more about your cashew cheese.. I’m very intrigued. Cashew Cheese sauces are delicious. I first discovered them when I was diagnosed with my dairy allergy and soon after googled ‘vegan cheese recipe’. I quickly noticed soaked cashews were the basis of many recipes and just went for it. My absolute favorite is cashew cheese queso, which I found on the blog Detoxinista. Even though I don’t agree with her food combining restrictions, I do enjoy a fair amount of her recipes. Especially the homemade Klondike bars and mac’n’cheez. But back to the queso, I slather that dip on tacos, burritos, burrito bowls, nachos, and whatever else it seemingly pairs well with. You’ll have to let me know if you try it or some form of cashew cheese. (My hubby, who can eat cheese loves the flavored cheese sauces like queso and red pepper more than the plain one. I like ’em all). I really cannot believe how versatile cashews are!! I’ll hope to give it a try soon. I have never tasted Cabot cottage cheese, and now I’m kinda jealous. I love this post Kristina. I agree with every single one, except I do gluten-containing bread and I like dark roast. I also buy whole grain crackers, breakfast cereals and packages of instant oatmeal and lots of bananas, apples and other fruit for my kids. I’m with you on it all! (Except the eggs and dried fruit!) I go through milk and veggies like no other! haha!! you go through milk like I go through eggs. DANG!! That’s some serious greens girl. LOVE IT! HUMMUS!! glad you’re a half and half fan too… often clients can’t believe that I use it in my coffee.. I’m like pinch me, I’m real too. Fun post to read and think about on my end – my answers are similar: peanut butter, lowfat milk and buttermilk (we make pancakes/waffles weekly), bananas, canned tomatoes, low sodium veggie broth, greens, beans, oatmeal & seasonal produce. I want to make all of these recipes! thank ya Deanna!! Buttermilk is so unique… but you know I love me some pancakes. So many of these items are on my must have list too. Also, I love the dried cherries in the tuna salad idea. That sounds awesome! it is so awesome. gotta give it a try. I love this idea! I’ll definitely share a top 10 list on my blog too— enjoying some almonds I picked up at the store yesterday while I type this! 🙂 PS. Love the seasonal produce add-in! I ALWAYS have 0% plain Greek Ypgurt in my cart. I go through at least 2 big containers a week o_o. It’s an issue haha. And always bananas, nut butters, spinach/greens and eggs! Greek yogurt has so many uses.. I can totally agree with you there.